This versatile bead and wire pendant is easy to make with a beginner's level wire working skills and tools. It might take a little practice to get it exactly right, and having some special tools will definitely make the project easier, but it is still a great introduction to making wire and bead jewelry. The custom beaded chain also helps make it look more special, but is easy to make. The pendant design starts bymaking a basic U shaped wire frame. I used 20g red brass wire for the frame, but it will work just as well in other metals such as sterling silver, gold filled, copper or craft wires. Half hard wire will work better than soft wire like copper, but you can always harden the wire by hammering it a little. You can also substitute a slightly thicker wire like 18g if desired. You will also need basic wire working tools like round nose pliers, chain nose pliers, flush cutters and some assorted beads. Attach the 26g wire to the horseshoe shape wire frame by wrapping it around 2 or 3 times. It is easiest to wrap the wires if you start adding the beads from the bottom and go up towards the open side of the frame. That way you can pull the wire through the open gap when you are wrapping around the frame. Adjust the wraps so they are close together and placed where you want them on the frame. Once you start wrapping on the other side of the frame, you will no longer be able to adjust the placement of the beads as easily. Pick up enough beads to cover the distance across the wire frame. I am using 11/0 delica beads for the first row. Make sure there are enough beads to cover the gap but the wire is straight and taut. Wrap the wire around the frame on the other side two or three times to secure the beads in place. Go across the frame to wrap - not through the middle. If your wire is coming over the front of the frame like in this picture, wrap it over the front of the frame on the other side. Pick up another row of beads. I used 8/0 delica beads for the second row. Again, make sure you use enough beads to cover the wire but not so many that the wire will not fit between the frame. Also, keep the wire on the same side of the frame. In this picture, I have flipped over the frame, so once again my wire wraps are going over the frame. Add another row of beads to the frame. These are 4mm slightly irregular faceted cats eye beads. It is harder to get the large beads to fit exactly, so I added an 11/0 delica bead to fill in the extra space. Wrap the wire around the frame to secure the beads in place. Try not to distort the shape of the frame while you are holdng and wrapping. Use the wrapping wire to add as many rows of beads as you like. My last row repeats the 11/0 delicas from the first row. Wrap the tail around the frame to secure, push the tails close to the frame with chain nose pliers and trim the wire ends with flush cutters. A nice feature of this design is the open loops on the pendant. You can easily try different chains to see which one you like best. I decided to use the more delicate alternating loop chain on the left. My chain was a little short for the design, so I decided to customize it a little by adding a section of wire wrap bead chain on either side of the pendant. 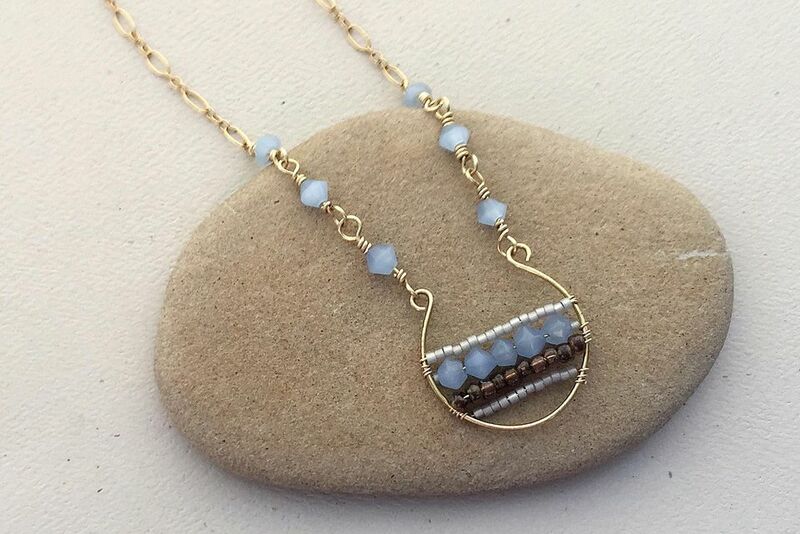 Wire wrapped bead chain is entirely optional, but it is relatively easy to do and a great way to add a little length to a chain that would otherwise be too short for your design. To make it, you will connect the pendant and chain with wire wrapped loops. Connect the chain to the pendant by twisting the loop open just enough to slide the chain in place. Twist the loop back into place. Repeat on the other side of the pendant. This pendant is so easy to make, you will want to make several in different color and bead combinations.